The de Lacy family blood-line benefactors to the Mittons were from Lassey, France, now in the Department of Calvados. They had an estate there and as was the custom in Normandy at the time, it was kept in the family and was not divided by primogenitor but by the Norman “tenure of parage” which keep it undivided in the family. Ilbert and Walter joined William’s campaign to conquer England.They attached themselves to different superior Lords for the expedition. Ilbert, as the elder brother, followed Odo, Bishop of Bayeux, the half-brother of William, Duke of Normandy. Odo was the de Lacy’s overlord in Normandy and would have been Ilbert’s liege lord. Walter attached himself to the train of William fitz Osbern. Ilbert and Walter were hereditary fiefs (tenants) of Bishop Odo of Bayeux who in turn was a fief to the Duke William of Normandy. As fiefs they were expected to maintain the fief, with the castle and other buildings in good order and the land under cultivation; to contribute to the wealth of the Bishop by turning over part of the collected rents and farm products. One of the key elements of a fief was the aspect of military service. This meant supplying equipped armed warriors and horses when they were needed, and going to war when ordered to. After the victory at the Battle of Hastings both Ilbert and Walter, like other Norman Lords, were individually rewarded by the grant of control of land in conquered England, while continuing to also control the fief in Normandy of both Lasci and Campeaux 12½ miles from Lasci. “This fief” (in Normandy) “was afterwards held in parage” (equality in inheritance) “by the heirs of Walter and Ilbert”. The brothers were chevaliers (knights) who fought at the Battle of Hastings in one of the “conrois” (tactical unit of the army) with others from the area around Vire. It is said that “the lords of Lassy…”struck the English” (Anglo-Saxons) “impetuously, not fearing pike or ditch” while fighting for their Duke of Normandy during the battle for the English crown. No particular deed is attributed to either except we know they were with William at Hastings. One source names the Sire de Lacy as one of a party of seven or eight knights who charged the English in company; the Sire de Lacy, “fearing neither price nor pope. Many a man did they overthrow, may did they wound and may a good horse did they kill”. This is from J.R. Planche, Somerset Herald, London 1874 book, “The Conqueror and His Companions“. However, how credible this is is uncertain. Other than this as to what specific role they were designated at Hastings we don’t know. The reference that attributes *Ilbert as one of the knights that went with William on the final charge to kill Harold the Saxon King may have merit and explain why Ilbert was regarded as a favorite of the Duke of Normandy. We do know he was a close companion after Hastings and accompanied William during the subsequent “Haring of the North” to put down Saxon rebellions to Williams rule. For that he received over 170 manors in what became York and built Pontefract Castle, one of the great castles of medieval England. The Norman born de Lacy’s are regarded as much for their post Hastings prominence as companions of William, Duke of Normandy in the final conquest of England. This too might explain why Ilbert is referred to as a favorite companion of the Conqueror. Ilberts helping hand in the `harrying of the north` during King Williams final campaign in the north to secure the whole of England as the Conqueror. We know Ilbert was well rewarded by William and eventually became a `tenet in chief` to the new Norman Kings. The lands given to Ilbert by the Conquer were strategic to securing the north of England from Scots incursions and any further Saxon rebellion. Later Walter, the other de Lacy brother, went on to secure the Welsh marshland for William after Hastings and left his own pedigree. Walters descendants have no connections with the later de Mittons of Ilbert`s Clitheroe area scion families. However, Walters great, great granddaughter was married to Robert the Bruce, whose pedigree was also of French Norman heritage. Ironically she was held in jail by Edward l during the campaign against Robert. Henry de Lacy, third Earl of Lincoln was the chief counselor to Edward at the same time. Ilbert’ s descendants became more prominent in the following centuries as great land owning Barons and signatories of the Magna Carta. This legacy would finally include the cited 2nd. Henry de Lacy, 3rd. Earl of Lincoln as a prominent counselor and trusted ally of Edward the 1st (aka. Long-shanks) during his battles with the Scots and as regent to Edward ll and Lord Protector of the Realm. The north of England had never really been under complete control by the Saxons kings. This had always a problem for Edward the Confessor, the last Saxon king who died at the end of 1065. His death precipitated the row between Harold and William over who was the legitimate successor to Edward as king of England. That culminated in the Battle of Hastings and the death of King Harold ll (Goodwinson of Wessex) on Oct. 14th, 1066 the day of the battle. This is all depicted in the Bayeux Tapestry which is on display in Bayeux, France. Editor’s note: It was a visit to Bayeux in Sept. 2007 that initiated my interest to research this history. The “Harrying of the North” initially took place during the 1069-70 winter to subdue the English earls after a post-Hastings rebellion resisting William’s conquest of all England. Ilbert campaigned with William to subdue the Saxons in Yorkshire.They went north into the Northumberland area. It was one of the worse scorched earth policies of history killing 10% of the population in is what now Yorkshire. It was to deny the Saxons any means of livelihood and bring about complete Saxon submission to Norman rule. The “harrying” was so brutal and destructive that William supposedly asked for forgiveness on his deathbed (not likely according to accounts). Once the subjugation of the native Saxons had been accomplished, England became, for the first real time, a unified kingdom under William the Conqueror, secured by over a thousand “mott and bailey” castles by the 1100`s. Thus William is called the “Conqueror” and things haven’t been the same in England since. This began a great 1000-year odyssey of epic conquests and expansion from William’s legacy. His was perhaps the biggest of all and this legacy still looms as the greatest change of England to this day. The world’s political map would not be the same without William’s conquest in 1066. 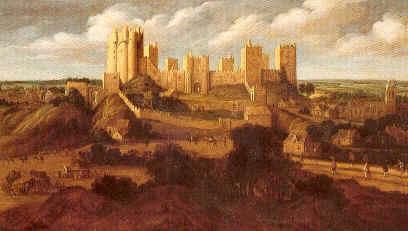 Ilbert de Lacy benefited as well for his part in the Conquest and was given vast lands in Yorkshire and built Pontefract Castle. Ilbert the older brother had followed his Norman overlord, Bishop Odo of Bayeux into England and then became en-feudaled as a tenant of the Bishop soon afterward and later becoming a tenant-in-chief direct of the King. Ilbert possessed one hundred and seventy lordships – the greater portion of them in Yorkshire, Nottinghamshire, and Lincolnshire. His son Robert held the Blackburnshire 100 and Pontefract when Roger de Poitou was deposed and banished in 1102. Robert was then given the Honour of Clitheroe by King Henry I when he became Lord of Bowland making the de Lacy family one of the most important and influential in the north of England. Clitheroe Castle became the administrative center of the de Lacy’s western estates as the Honour of Clitheroe. It was demesne manor lands in and around Clitheroe that were granted to “Ralph the Red” by Robert de lacy in the Nov. 23rd,1102 charter. The grant to Ralph was the largest “alienation” of the de Lacy barony to that date and done very quickly further suggesting a blood relationship to get so many feudal manors that quickly after Robert de Lacy became Lord of Bowland. The de Mittons remained loyal to the de Lacy’s and vice versa for over the next two hundred years. The castle keep at Clitheroe is attributed to have been built by Robert de Lacy (if not by Ralph the Red upon his arrival in 1102). Others suggest that some type of fortification was in place at least as far back as to Roger de Poitou`s tenure. However, “Their is no real evidence for the suggestion that Roger of Poitou built it“-The Lacy Family in England and Normandy 1066-1194, W.E. Wightman-1966. The castle remains to this day although many of the other buildings are now lost. The stone castles built in the late 11th and early 12th century signify the wealth of the de Lacy family at that time. Stone castles were expensive to build and only the great Barons of the era could afford them. Ilbert de Lacy of the Conquest died around 1093 during the reign of King Rufus. Robert de Lacy then inherited what was called the “Great Fee of Pontefract” or all the feudal lands known as “Honours” including Clitheroe, that had been granted to his father by King William. King William Rufus confirmed those holdings to Robert. The de Lacy’s possessed 170 or more manors in this part of England. Later with more land acquisitions the family possessed or sub-feudal nearly 200 manors. They could “travel all week and always be able to stay in one of their manors each night from one end of their domain to another”. The feudal lands of the de Lacy Barons eventually covered over 500 sq. miles of northern England. An Honour : In medieval England, an honour could consist of a great lordship, comprising dozens or hundreds of manors. Holders of honours (and the kings to whom they reverted by escheat) often attempted to preserve the integrity of an honour over time, administering its properties as a unit, maintaining inheritances together, etc. The typical honour had properties scattered over several shires, intermingled with the properties of others. Usually, though, a more concentrated cluster existed somewhere. Here would lie the caput (head) of the honour, with a castle that gave its name to the honour and served as its administrative headquarters. 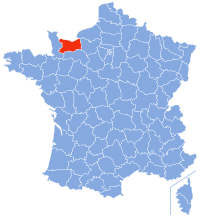 de Lacy (Laci, Lacie, Lacey, Lascy, Lasci) is the surname of an old Norman family whose home castle was in the village of Lasci (today Lassy), 20km (12½m) from Vire in what was then Normandy. The shape of their castle can still be detected in a field at the edge of the village. Ilbert ([H]ilbertus) and Walter (Walterus) de Lacy are the two Lords of Lasci who in 1066 accompanied Duke William II of Normandy to England and fought the Battle of Hastings. They became the founders of two separate families by the name of de Lacy in the United Kingdom. The two Lords of Lasci were chevaliers (knights) who fought in 1066 in the Battle of Hastings in one of the “conrois” (tactical unit of the army) with others from the area around Vire. It is said that “the lords of Lassy…”struck the English” (Anglo-Saxons) “impetuously, not fearing pike or ditch” while fighting for Duke William II of Normandy (William the Conqueror) during the Norman conquest of England.. Despite this bravery they were not amongst the favoured few who were individually named as having participated in the Battle of Hastings. Ilbert and Walter are strongly believed to be brothers. Proof of their relationship comes from their estate in Normandy. Heirs of both families shared in the inheritance of the estates of the family de Lacy in Normandy. The single holding was held jointly by descendants of both Ilbert and Walter by the Norman tenure of parage. Under parage land was divided amongst the sons and daughters whilst at the same time remaining a single fee. This tenure could only apply to a family holding, and the family link must have been via Ilbert and Walter as sons of the same father as shown in the details of the dissolution of the joint fee. Ilbert and Walter were hereditary fiefs (tenants) of Bishop Odo of Bayeux, who in turn was a fief to the Duke of Normandy, William the Conqueror. As fiefs they were expected to maintain the fief, with the castle and other buildings in good order and the land under cultivation; to contribute to the wealth of the Bishop by turning over part of the collected rents and farm products. One of the key elements of a fief was the aspect of military service. This meant supplying equipped armed warriors and horses when they were needed, and going to war when ordered to. After the victory at the Battle of Hastings both Ilbert and Walter, like other Norman Lords, were individually rewarded by the grant of control of land in conquered England, while continuing to also control the fief in Normandy of both Lasci and Campeaux (which is 20km (12½m) from Lasci). “This fief” (in Normandy) “was afterwards held in parage” (equality in inheritance) “by the heirs of Walter and Ilbert”. Ilbert was probably the older brother. During the Battle of Hastings in 1066 Ilbert followed his Norman overlord, Bishop Odo of Bayeux, into England, and then became enfeoffed as a tenant of the Bishop soon afterward, before later being able to be a tenant-in-chief direct of the king. In contrast Walter arrived in the train of William FitzOsbern. The younger brother would probably have no obligation to follow his liege lord outside Normandy and thus could choose to attach himself to the most convenient leader he could find. Walter was still attached to William FitzOsbern for the campaign into Wales in 1069, while Ilbert was following his liege lord in “The Harrying of the North” of England. An additional piece of evidence comes from the grant of 22 acres of land at Montmain in Normandy to the Nunnery of St. Amand by “Emma, the mother of Ilbert de Lacy”. She was described as such to distinguish her from the Abbess of St. Amand by the same name. This implies either that Ilbert was the more important of the two brothers in Normandy, and under the rules of tenure by parage therefore the elder, or else that Walter was not Emma’s son, but either an elder son from an earlier marriage of their father, or a cousin. The first is excluded by Ilbert being the brother who accompanied his Norman overlord, the Bishop of Bayeux, into England. If they were brothers then Ilbert was the older. The second is impossible in view of the later descent of the fee. It is most likely that Ilbert was the elder brother, and that Emma was the mother to both men. Further evidence that Emma was probably the mother of both men comes from the naming of Walter’s 2 daughters, one was named after his wife, and the other was given the name Emma. Ilbert and Walter, with their mother Emma, are the earliest members of the family for whom there are records. It is believed that their father’s name may have been Hugh, as they both named a son by this name.